That in this day and age… men no longer take either God or Satan seriously, arises from the fact that they have come to think of both alike only objectively, only as persons external to themselves and for whose existence no adequate proof can be found. • Adding to our collection of original audio recordings, we have new Chinese and English readings of the extraordinary medieval document called “The Hundred-Word Eulogy” (Baizizan), written by the Founding Emperor of the Ming Dynasty, Zhu Yuanzhang (14th century) in praise of the Prophet Muhammad. 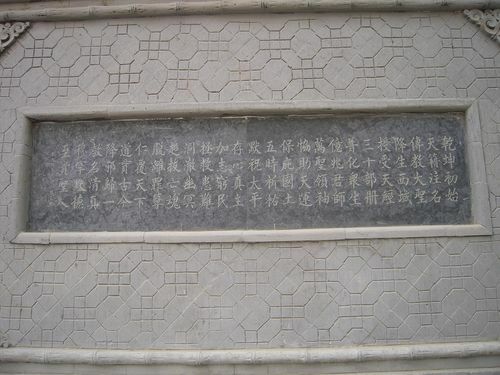 Inscription of the poem at Dongguan Mosque, Xining. • Complementing our first article, we have “The Self as Enemy, the Self as Divine: A Crossroads in the Development of Islamic Anthropology” a study by Taneli Kukkonen on a key point of traditional Sufi psychology. No-one is exempt from the character-building exercise of repentance (tawba). Furthermore, according to Ghazali, the wayfarer’s soul is ever a work in progress, with work always remaining to be done, hence the need for constant and never-ending vigilance.